The DS67U3 is a fanless slim PC with a robust 1.3 litre metal chassis and exceptional connectivity: HDMI, DisplayPort, Dual Intel LAN, USB 3.0/2.0, serial ports, audio, card reader and W-LAN 802.11ac with two antennas. Installation of components goes straight forward, as there is plenty of interior space for two memory modules, a 2.5" drive and an M.2 SSD card. The built-in Dual Core Intel "Skylake-U" processor with integrated HD graphics provides ample performance for playback 4K content. Thanks to its re-designed passive cooling architecture, the system is virtually maintenance-free and is approved for 24/7 nonstop operation. It is big on performance, yet extremely energy-efficient. 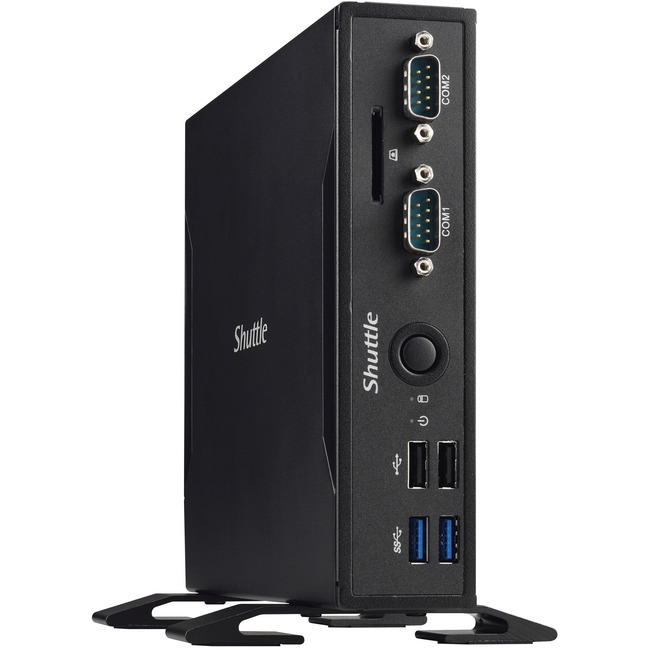 The Shuttle Slim-PC Barebone DS67U3 is an ideal platform for professional applications such as digital signage, POS, Kiosk, Thin Client, Cloud Computing, Office PC and Multimedia.